LPR rods are friction welded, specially hardened and made of the highest steel quality. The advantage of friction welding is that different steel qualities can be chosen for the mid-body and the ends, combining a high quality alloy steel for the ends, increasing the strength in the threads where it is required, with a light and thin material in between. LPR rods have a special surface hardening on the ends, giving good wear resistance and swift and easy joining. The rods have 4 spanner flats on each pin and box end. Thread protectors are available as an optional extra. The rods can be used both for DTH hammer and for rotary drilling. HPR rods have threaded ends which are shrink-welded onto a heavier wall tube section. The ends are manufactured from alloy steel and specially hardened for good wear resistance. 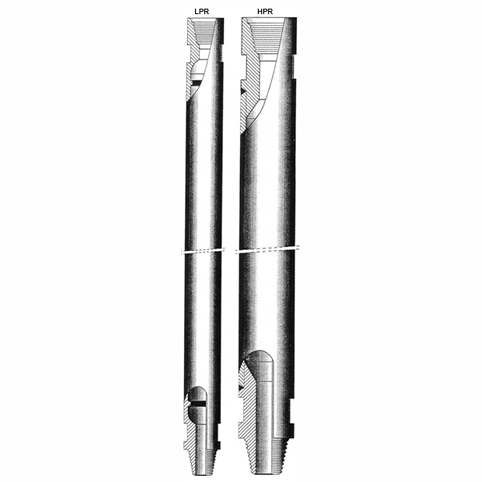 These rods are suitable for both DTH hammer and rotary drilling. Standard lengths are 0.5, 1.0, 1.5, 2.0 & 3.0 m. Alternative lengths, diameters and thread forms available on request. Minimum order quantity may apply to selected types.